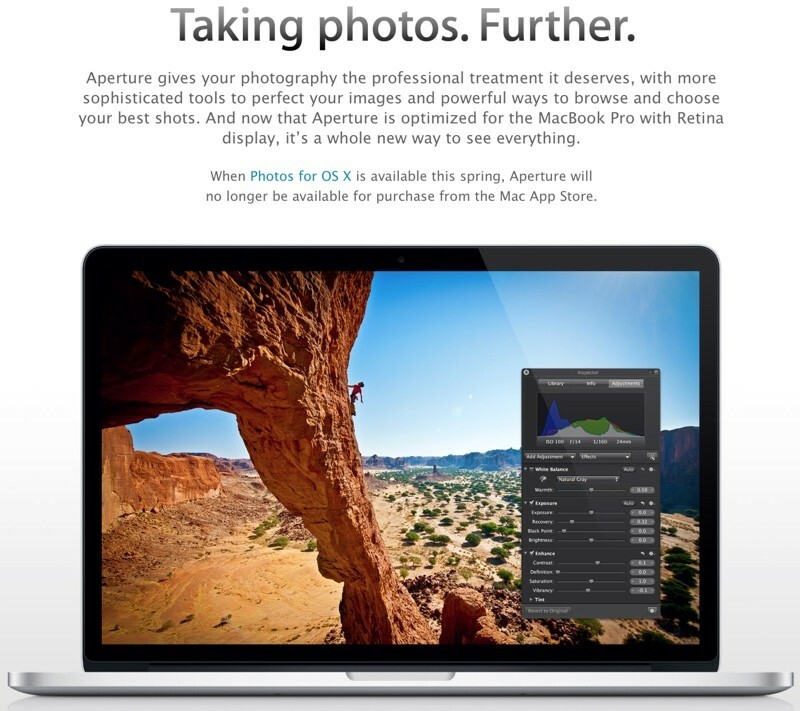 Shortly after last week's deployment of OS X 10.10.3 to developers, Apple updated its official Aperture page on its website, adding a notice stating that Aperture will be removed from the Mac App Store when the Photos for OS X app launches. The same notice can also be found in the app's Mac App Store description, as noted by MacGeneration [Google Translate]. Once removed from the Mac App Store, it will no longer be possible for new users to obtain the Aperture software, but those who have previously purchased Aperture will continue to be able to download it from the "Purchases" tab. Apple first announced the shuttering of both Aperture and iPhoto back in June, but the company did not specify at that time that the software would be removed from the Mac App Store entirely. Instead, it said only that there would be "no new development of Aperture" as it focused its resources on Photos for OS X. Our first look at Photos for OS X came last week alongside the developer launch of 10.10.3, as several sites were given preview copies of the software ahead of its release. Reviews have suggested that the Photos for OS X feature set lies somewhere in between that of the consumer-oriented iPhoto and the pro-oriented Aperture. iPhoto users will find they have more control over photos with new tools, while Aperture users will be disappointed to find that many tools, like the loupe, brushable adjustments, and custom metadata are missing. The general opinion is that in its current iteration, the Photos for OS X software is not suitable for professional users, and those who currently use Aperture will want to continue with the software or switch to an alternative like Lightroom. The Photos for OS X software could see updates over the coming months to add more pro-oriented features such as third-party plugins, and there are certainly some benefits to the app -- it integrates with iCloud Photo Library, its editing tools are easy to use, and it's said to be much faster than iPhoto. Photos for OS X will be released in the spring when the OS X 10.10.3 update is seeded to the public. Ahead of the official launch, Apple is planning to do a public beta, though a date for that is unknown. Photos for OS X is such a huge improvement over iPhoto and Aperture this makes sense. It's just incredible that Apple is going to be giving away the world's most advanced photo application. I hope nobody complains. have you used aperture or photos?? photos is dumbed down crap! Excellent. Now replace iTunes with something that works. Too bad, I'll miss Aperture. I'm still going to keep using Aperture. I think you've been here long enough to know that won't happen. Why would apple do this ? Aperture is a good product and they make money off of it.... So why get if of it? The only surprising thing with this announcement is that apple actually made the announcement. They usually don't communicate future plans. With that said, I am truly saddened by this, Aperture was an excellent product that beat Lightroom out the door when it was initially released. Apple could have done so much with this app and really cornered the market with photographers but they dropped the ball and let the app just whither on the vine.